The streets of Laying Fallow are starting to take on the feel of an abandoned town in the Wild West. 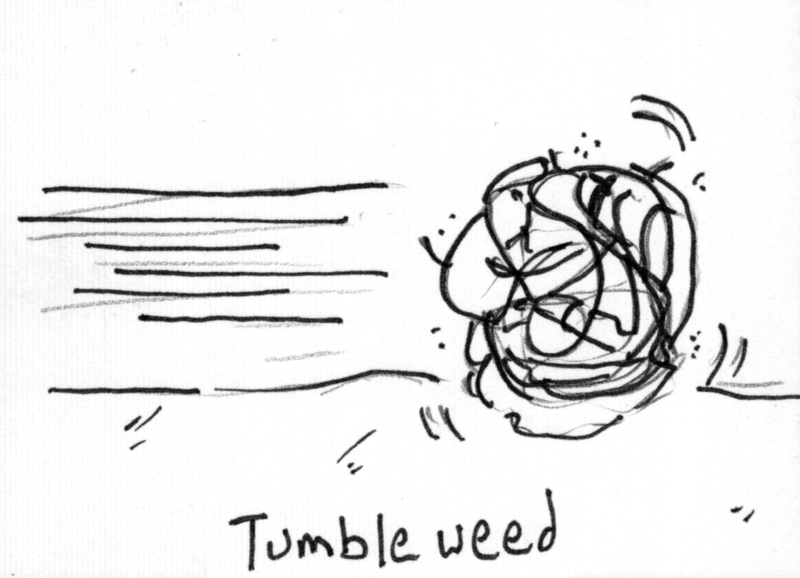 I think I just caught a glimpse of a tumbleweed rolling off screen between posts. Dust is accumulating on the front porches of the Artist Trading Cards. But, dear readers, it is just a front. It isn’t a Hollywood set–Styrofoam pillars, nothing behind the fancy storefront, and ready to be torn down at a moments notice–but a ghost town in which an evil genius has set up shop in the old saloon. As one walks in the doors of the saloon it may appear abandoned but a strange glow emanates from the door behind the bar. If one has the courage to open that door and peak inside the sight might be horrifying. In the corner a pasty white giant is hunched over a table littered with eraser droppings, pencil shavings, and crumpled sheets of white office paper, illuminated by a single goose-necked light. An ink stained index finger rises to his lips and he says, “Silencio……silencio, por favor…..silence”. He gets back to work and the observer leaves, shaken but curious. My over-the-top imagery is intending to tell you all is that I am still out there, writing, sketching, and inking new images. This grand experiment has started to find a path, I have turned evil, and I have become a genius. When I started this year my goal was to try and find a style and creative focus that was my own. In order to explore the world of graphic storytelling I set some well-defined personal constraints. I would tell my stories in a 10 x 15 inch page, with three rows of panels making up each page. I did not want to try and do anything fancy in terms of layout and structure at the start. I needed to figure out how to tell a story by combining words and pictures, creating a style that became interdependent on both of those elements, not just an illustration of the story. I also wanted to force myself to draw and write so I set lofty goals of posting a weekly comic and a weekly Artist Trading Card. Then the reality of our life in Turkey set in. We are a family of four navigating a foreign country and language while homeschooling our kids. Personal time became scarce between cooking dinner, teaching fractions and trying to buy nails at the hardware store (a task that should take five minutes could take an hour if words spoken in Baby Turkish were misunderstood and invitations to drink tea were involved). Jocelyn and I realized we both needed our space to work on our own stuff and instituted a rotational schedule for teaching and personal time. And I realized my publishing goals were unreasonable. But I did not give up trying to figure out this medium of storytelling. And as I completed each comic I began to realize what I liked to do and how to do it. Nine months into this project I have given myself the freedom to start breaking my personal rules and create comics that are longer than one page (Click to see Uniform Lack of Quality post) and not just a three row format (the current project I am working on). With this new permission I am really excited to see what emerges. It is just going to take a little longer to produce so, please, be patient. In order to fill the void between comics I hope to post brief blog posts, sketches, or the pages of the new comics in a serial format to prevent the buildings in my ghost town from crumbling. Enjoy. Hey, breaking the rules is always good…it leads to more creativity. It’s your blog, so do what feels right. I’ll be curious to see what you come up with. ah yes, reality. that’ll getcha every time. it’s a wise man who can roll with it and adapt. 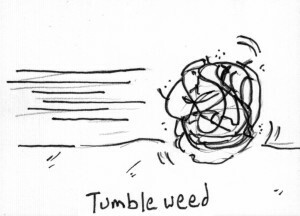 What pisses me off is that I couldn’t draw a tumbleweed that well, and you weren’t even trying. Is it any wonder I’m not allowed to help Haakon with his paper crafts? Returning to my jigsaw now.